By the 19th century the Osage tribe were living in Missouri. In 1804 members of the Meriwether Lewis and William Clark exhibition encountered the Osage. They gave a friendly reception to the explorers and were extremely interested in trading goods. They were given peace medals and the following year some of their leaders visited Washington where they met President Thomas Jefferson who described them as "the finest men we have ever seen." He also arranged for them to be painted by Charles Evert de Saint-Memin. The Osage raised crops but during the summer they went on buffalo hunts in Kansas. In about 1820 the Osage migrated from Missouri to Kansas. Hunting buffalo now became more important to the tribe. Every part of the buffalo was used. They provided them with food (meat), shelter (buffalo skin tipi covers), clothing (hide robes), fuel (dried buffalo dung), tools (horn spoons and bone hide scrapers), weapons (buffalo hide shields and bow strings) and equipment (rawhide envelope for storing food). 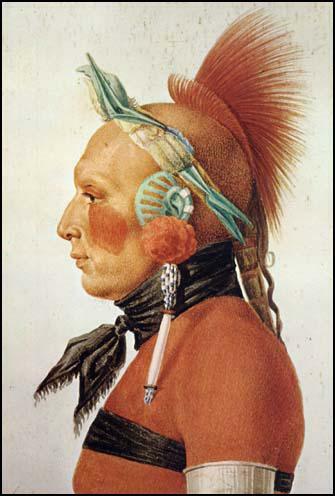 The Osage were friendly to the American settlers and served as army scouts. However, in 1870 they were forcibly removed to the Indian Territory in Oklahoma. These Indians hid established a custom of taxing every herd that went through the Nation 10 cents per head. Several other herds joined with us in refusing to pay this, and we never did, though many times it looked like war. When we were crossing into Kansas, somewhere near Bluff Creek, we were attacked by a band of Osage Indians, who would ride into the herd and cut out little bunches of cattle, sometimes as many as fifteen or twenty head at one time. It was straight-out robbery, and I told the hands to shoot the first Osage that cut another cow.